Your audio system allows you to listen to music from your Bluetooth®- compatible phone. This function is available when the phone is paired and connected to the vehicle’s Bluetooth® HandsFreeLink® (HFL) system. Not all Bluetooth-enabled phones with streaming audio capabilities are compatible with the system. 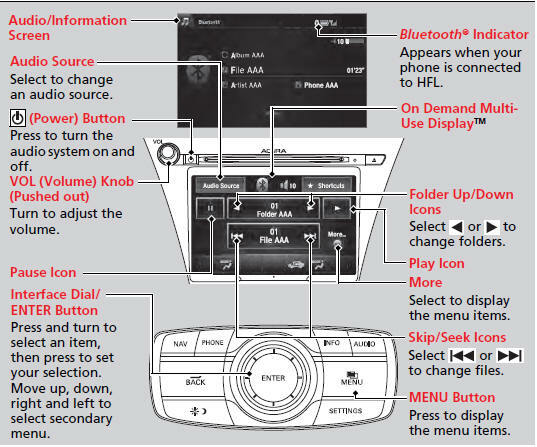 For a list of compatible phones: • U.S.: Visit www.acura.com/handsfreelink, or call 1-888-528-7876. • Canada: Visit www.handsfreelink.ca, or call 1-888-528-7876. In some states, it may be illegal to perform some data device functions while driving. If more than one phone is paired to the HFL system, there will be a delay before the system begins to play. You can control Bluetooth® Audio using voice commands.